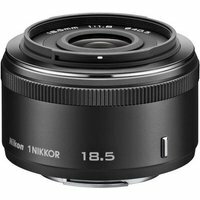 The Nikon 18.5mm f1.8 1 Nikkor Black Lens is one of the fastest lenses in the Nikon 1 series and is designed for the Nikon 1 compact system cameras, such as the J1, J2 and V1. This fast, bright f1.8 maximum aperture perfectly balances sharpness and bokeh (blur) and captures low-light moments with lots of clarity. Inside the 18.5mm lens is high-quality glass to ensure edge-to-edge sharpness even at maximum aperture. This small, sleek lens complements the Nikon 1 camera bodies perfectly, offering stunning image quality without sacrificing portability.